How would you like to have a watch that's shaped like a tooth? No? Us neither. But Seiko's just created a "Cavity" watch that's both shaped like a tooth and has a gigantic hole in the middle to display the time. 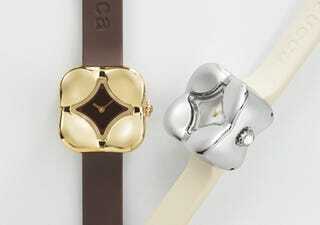 The watch comes in either silver or gold, but costs only $140 (16,800 yen). The point? To remind you every day that it's time to go to the dentist. Or eat more candy.